I still remember the first time I had chimichurri. It was many years ago in a Colombian city called Palmira, where I also spent a few years of my childhood. My husband and I were visiting because I wanted to see the old street where I used to live and play with my friends, the park where I used to go to with my family and the school I went to during the first few years of elementary school. I remember we stopped in a small bakery where I had one of the best “rollitos suizos“, which are small jelly rolls filled with whipped cream, while we stared at the security guard who had the tightest pants I had ever seen on a man his size. After a few hours of walking around my old barrio we ended up going to an asadero for dinner, which is a place that serves grilled food, and I ended up having punta de anca (top sirloin) with chimichurri. The flavor of the grilled beef was amazing but unfortunately the chimichurri was not that great because it was made with what seemed like 400 cloves of garlic and a ton of oil. Not the best first experience for trying out such a famous sauce. 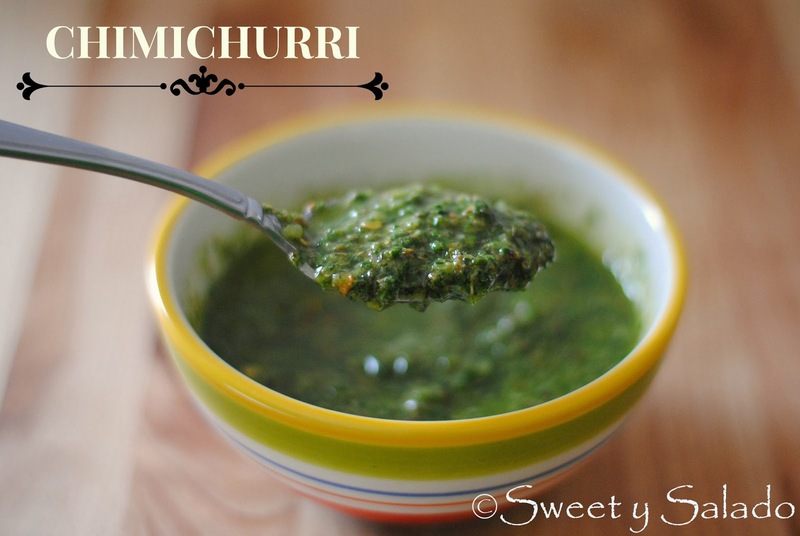 So, of course I had to search and try many chimichurri recipes before I could come up with one that really pleased me, and I did. I ended up adding cilantro and cumin because I’m Colombian and those are two of the most popular ingredients we use in our own recipes, but also becasue they give this sauce a really nice flavor. 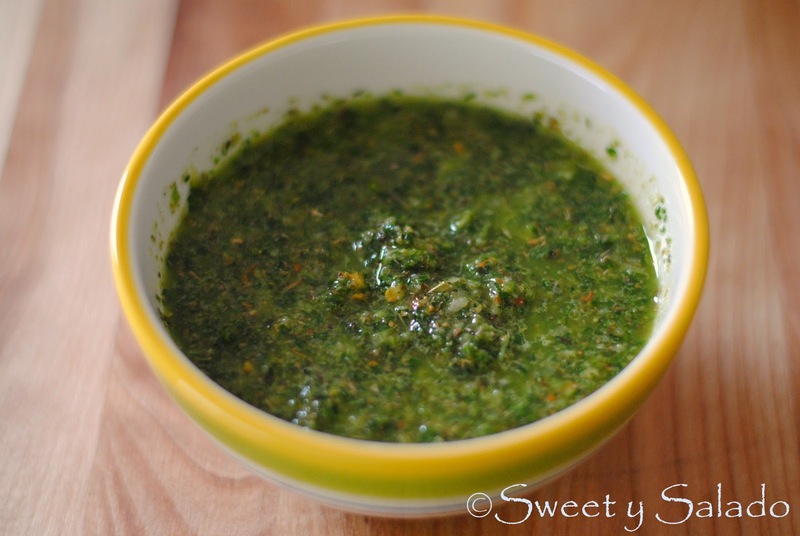 There are many versions on how to make a great chimichurri and I really hope you enjoy the recipe I’m sharing with you today. 1. Place all of the ingredients in a food processor or blender and blend until you get a thick sauce. You can also slowly add the olive oil while the food processor or blender is running. **Note: If you prefer, you can finely chop and/or grind the cilantro, parsley, onion and garlic, then place them in a large bottle with the rest of the ingredients and shake it to make the sauce. One of my favorite sauces, too! It's so fresh and versatile. I love the mention of the tight-pants-wearing security guard. 🙂 Cutie! Hi Hilah, it's always great to see you. And yes, my husband and I still talk about the security guard's bulge every time we make chimichurri. Good times!